Once you finish carving your first gnome the little guy will surely want you to carve some more elfin friends for him! 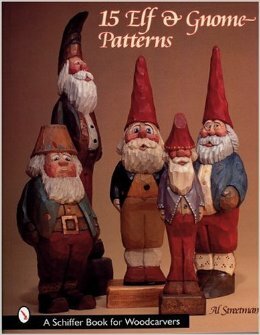 It's a good thing Al Streetman has included 15 different patterns for well-dressed elves and gnomes of all shapes and sizes--drawn up with the beginner in mind but with plenty of potential for the experienced carver's creativity to build on. With step-by-step instructions and color photography Al demonstrates how to carve and paint the first project from start to finish. He also provides some helpful general advice about technique finer details and painting; his reference charts are handy for any carving. A full-color gallery of finished projects will bring a smile to your face and a spark to your imagination.